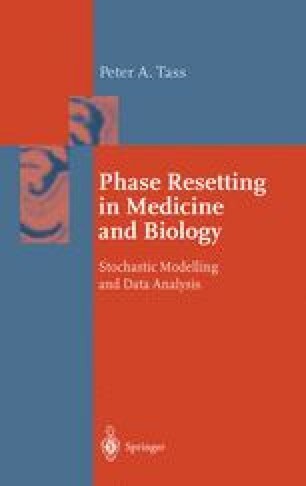 Before we dwell on prospective modelling studies in the context of neuronal phase resetting, let us first recall the starting point of our modelling approach. The repetitive firing of a neuron in the Hodgkin and Huxley (1952) model for the squid axon corresponds to a motion along a limit cycle (cf. Murray 1989). As explained in Sect. 3.4 a limit cycle oscillator can be approximated by means of a phase oscillator (Winfree 1967, Kuramoto 1984), and, thus, a population of repetitively firing neurons can be modeled by a cluster of phase oscillators.